Notes: Directed by Naoko Yamada; based on the manga by Yoshitoki Oima. As a sixth-grader Shoya Ishida was unspeakably cruel to a deaf girl in his class named Shoko Nishimiya, eventually driving her out of the school, but he didn't exactly get away with this unscathed: his behavior was publicly "outed" in the classroom, along with that of others who were either co-conspirators, enablers, or ones who just stood aside and let it happen- and all those other kids implicated in the matter are quick to heap ALL the blame on Ishida. Ishida spends the next five years virtually having a target painted on his back, being shunned (and occasionally even being physically abused in the same manner as he'd done to Shoko), and finally finds it all unbearable. He contemplates suicide, but there IS an alternative: repairing the damage he's caused, to himself and to others, by seeking forgiveness from, and making amends to, the people he's harmed- particularly Shoko. Now at this point I'll note some things that might seem like criticisms, but I didn't really think detracted from the dramatic power of the story- which is pretty damned impressive. Yes, the treatment here can get melodramatic, but this is one of those shows that's EARNED its license to practice melodrama, in spades. Number Two observation is that Ishida MIGHT have attempted to overcome the demolition of his status among his peers by, well, getting some new peers- in other words, transferring to a school somewhere remote, though the idea doesn't seem to have occurred to him. Number Three is that we know, by the Laws of Fiction, that there's going to be a relationship of SOME sort established between Ishida and Shoko at some point, but Ishida's going to have to go more than halfway to get there (he's already making a start at learning sign language), and things are going to be turbulent, even near-tragic, along the way; detoxifying the poisonous atmosphere his sins toward Shoko created means more than just getting HER on board. (And, despite objectively being blameless, Shoko's not beyond developing guilt feelings herself, which cause MORE problems.) One effort Ishida makes, to reassemble key players from that 6th grade class to hash things out, falls apart disastrously because the parties involved- at this point still including Ishida- are all STILL more into blame-shifting rather than taking full responsibility for their own parts in the original tragedy. Yuzuru is a kid who's obsessed with protecting Shoko, blocking Ishida's initial attempts to make amends with her. I can't say another word about this character, though this one became one of my favorite people in the whole show. Tomohiro Nagatsuka is a short, chubby kid who, as the Wiki article on the movie points out, is also an outcast, and so doesn't feel any problem with accepting Ishida, becoming the first new friend he's had in years (and, for a while, the only friend he has at all.) Nagatsuka's also the show's main comic relief, a delightful loyal sidekick. Naoka Ueno has changed the least of any of Ishida's original posse. She was complicit in much of Ishida's original cruelty to Shoko- and STILL feels the urge to verbally attack and belittle her. It's actually pretty obvious where all this hostility comes from, and given where it DOES come from, Ishida's now putting Shoko front and center in his life just makes Ueno that much more hostile. Before the movie started, the theater I was watching this in presented some "trivia" about the film (none of which is "trivial" to a reviewer of course!). One thing I noted was a claim that "61 pieces" were composed for the soundtrack, but I certainly didn't note that many, so they must have been pretty unobtrusive. Of course as an old-time Who fan, I certainly DID appreciate "My Generation" appearing on the soundtrack. The only 3D CG I noted was a roller coaster, which was made to look every bit as scary as it would have looked in real life. The Recommendations? Now, WHERE have I seen a girl getting bullied recently? Hmm. Plus, we'll throw in another show about some delinquent activities in a school by a wayward student and her accomplice. Recommended Audience: Includes suicide attempts by two young people, as well as cruel bullying (involving physical violence) against a young girl. 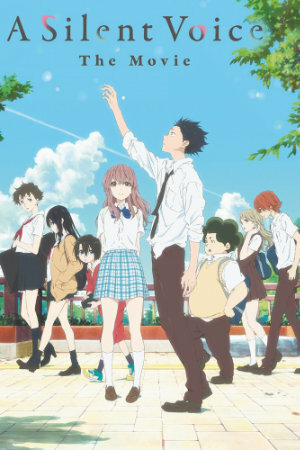 A Silent Voice - The Movie © 2016 Kyoto Animation.